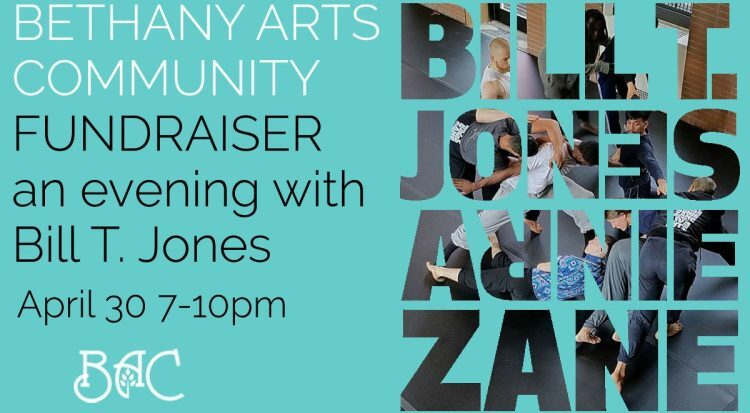 Come celebrate and support the return of the Bill T. Jones/Arnie Zane Company for their second residency at Bethany this June. The evening will feature guest of honor Bill T Jones, who will share thoughts on his company’s time at Bethany, the meaningful work they will be developing while at Bethany and a sampling of their work. The festivities will include music, gourmet delights and beverages, and a chance to view a special exhibition celebrating the life and work of Ed Malsberg, a 100 year old practicing artist based in Ossining. Residencies give artists like Bill T. Jones and his company time to immerse themselves in the creative process and develop new works that will be presented globally. Bethany’s programs support artists at every stage of their career through presenting opportunities, residencies and professional development for artist as entrepreneur. With the generous support of individuals like you, our residency programs make it possible to support artistic development while allowing our community to enjoy access to the most innovative artists working today. VIP tickets include admission to two special events during the Bill T. Jones/Arnie Zane Company residency this June: an evening artist talk featuring Bill and Associate Artistic Director Janet Wong, and a work-in-progress showing of the stunning piece they have been developing- “The Deep Blue Sea”.